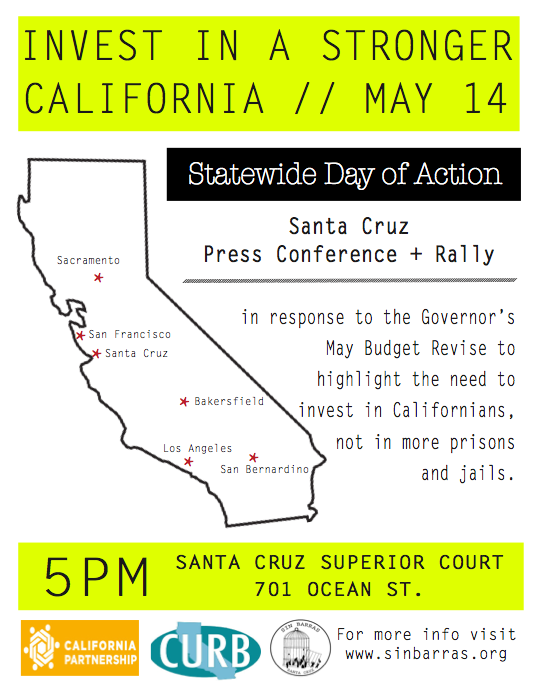 The community and Sin Barras held a Press Conference + Rally about the Governor’s May Revise Budget to highlight the need to invest in Californians and eradicate poverty. Watch our video footage here. The governor has proposed $500 million to build bigger jails we don’t need.​ In ​the Governor’s press conference this morning, we noted that funding to begin the expansion of medical parole, to begin an elder parole program and to create a parole process for non-violent and non-sexual second strikers has been cut to half what it was in the Governor’s January budget. There is $5 billion that is available right now to refund the decades of disinvestment in education, healthcare, youth resources, childcare, senior and disability services, nutrition, and other priorities that keep Californians strong. We need to invest in people and ​life-affirming ​programs that serve us, not debt, rainy day funds, and prisons. Our press conference was joined by Californians United for a Responsible Budget, California Partnership, and other anti-poverty organizations across the state.